In this powerful debut story collection, veteran travel write and climber Daniel Arnold brings to life the men and women--complete with their scars and dark corners--whose lives are defined by the mountains they climb. The characters who populate Snowblind are obsessed with the jagged beauty and driven by the physical ricks of dangerous summits. Their climbs end not on heights, but in the psychological aftermath, when their compulsions crash back into reality. Deep in Alaska, a fanatic soloist seeks her way back through the wilderness when her pilot fails to pick her up after a triumphant climb. In a climbers' hostel in Argentina, a young mountaineer tries to explain abandoning his fallen partner in a blizzard on Aconcagua. On K2, an anarchist fails to fit in on a modern Himalayan expedition--with disastrous results. Tension fills Arnold's stories, both from the finely crafted, sweaty-palmed drama of the climbs he imagines, and also from the cracks that open in each of his characters' psyches. 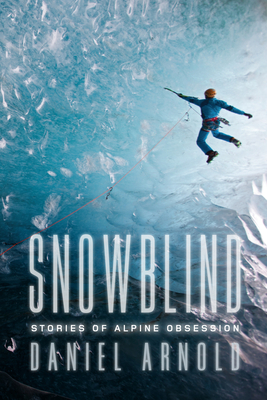 Snowblind is a dose of old world adventure writing made modern for a new generation fascinated by the mystique of climbing. For both serious climbers and those who may never tie onto a rope the thrill of these stories, complete. Daniel Arnold began climbing the Pacific Rim volcanoes and basalt crags of his native Portland as a teenager and went on to climb throughout North and South America. His work has appeared in Rock + Ice, ZYZZYVA, and The Mountain Gazette. His two books are Salt to Summit and Early Days in the Range of Light. He lives and climbs in Sonora, CA.